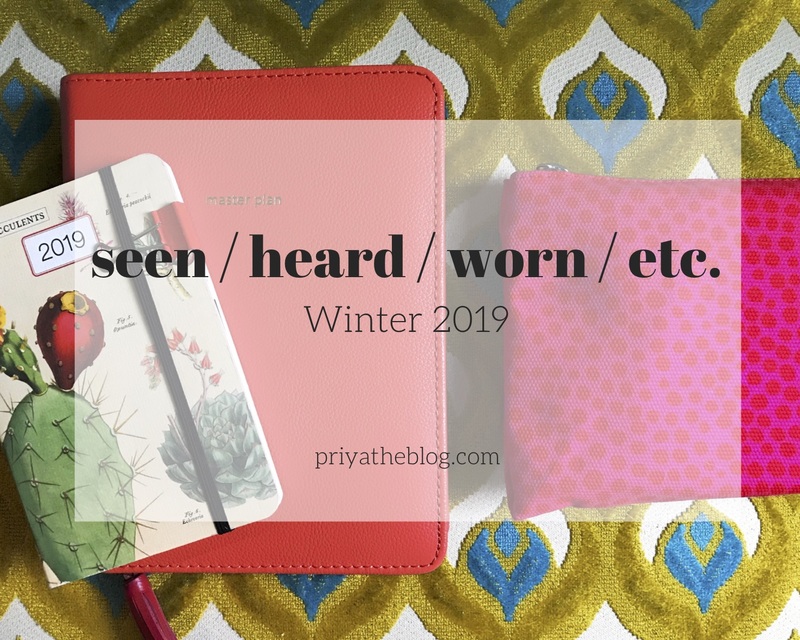 Seen / Heard / Worn / Etc. #4 | Priya the Blog | life & style in Nashville & beyond! SEEN // Ok, with the crummy weather + eating clean in January, we've been watching a LOT. + Patriot Act With Hasan Minhaj | Have I not talked about this yet?! This show is my new obsession. I'm not...great about being on top of current events & political issues, but Hasan presents them in a way that is informative and hilarious. Super well done, I'd recommend it to anyone! + The Innocent Man | I read this John Grisham book years ago, so I was very interested in this! Watching the show totally added a new dimension - seeing the town, meeting key characters, & even a new storyline altogether! I don't want to ruin this for anyone if you haven't seen it yet, but I'll happily discuss! + True Detective | Who's watching?? I've been very happy with Season 3, after a unanimously awful Season 2. Right away, it seemed they were going back to their roots for Season 1 - with a desolate Southern setting, 3 timelines happening simultaneously, & a few strong leads (instead of like, 10.) Mahershala Ali has been REAL good. Still time to catch up for the finale next Sunday!! + 20/20 | Just trying to quell my insatiable thirst for true crime, I've been on a 20/20 kick lately! I saw it on Hulu & it brought back so many memories of my childhood, we used to watch this on Friday nights? + Killing Eve | My anecdote - I was on a plane watching whatever thing I had selected out of dozens of choices, but could not stop glancing over at the screen next to me, where my seatmate was watching this! I decided that was as good a vote of confidence as any. Plus this show has been seriously buzzed about! I loved it - it was so unique, with super interesting characters, & the first season absolutely flew by. + Bohemian Rhapsody | [Strictly commenting on the performances/film as a whole, because I know there's been some controversy] I was so excited to see this, maybe more than anything else last year & this was before I knew Freddie Mercury was Indian & the child of immigrants?! I loved every minute of it. Rami Malek's performance blew me away (I mean, can you IMAGINE trying to play that character?) & the story/music of Queen is just so epic. These songs are some of the first music I ever knew. SO great. HEARD // Let's connect on Spotify! + Be the Cowboy - Mitski | I always love checking out "best albums of the year" lists, mostly to find new-to-me stuff. This album was consistently mentioned (so, sorry, this is not a groundbreaking rec), & was my favorite of the new albums I listened to. Mitski is super cool, & her music sounds...equal parts folky & electronic, to me (I'm not a professional.) Listen to: Lonesome Love. WORN // I'm not shopping (basically) right now, but here's a few lingering new-ish items! + Madewell velvet joggers | These magnificent pants were my Christmas present from Art. Does he know me, or what? Outfit ft. these coming later this week! Still totally available + on super sale! + Marimekko dress | A highlight of my trip to Finland was visiting the Marimekko outlet in Helsinki! I agonized over what special clothing purchase to make (their prints SLAY me) & finally settled on a tame striped button-up dress (I think this is the exact one, but mine is green.) Coming soon to a blog near you! + Nordstrom dress | Back in November in SoCal, I was still TBD on what to wear to my office holiday party. My SIL, Marisol, sold me on this timeless, bodycon, sexi but comfi & also slightly 90's dress that she also owns. I can only find it in plus sizes now! But it's perfect! + Wishlist, since I'm not shopping | These jeans, on my approved list when they go on sale, snakeskin shoes, a chic puffer coat, a Rhode Resort Ella dress for Summer, rubber Birkenstocks also for Summer! + Hungryroot | This is the grocery delivery service Art & I have been using so far this year. We'd tried Hello Fresh in the past, & while delicious, it didn't feel particularly good for you. Hungryroot is plant-based, & customizable to be vegetarian, gluten free, or vegan. They send you meal components ("base", "sauce", "grab & go") with meal ideas, instead of a full regimented meal plan, which we actually preferred - it gives you the option to be a little creative. So far, we've been really happy with it. It is a little more pricey than a normal meal delivery option, but it makes sense for higher quality ingredients & more organic offerings. Here's a referral link to check it out, if you're interested! + Olly Vitamins | I've never been a vitamin taker, but my bf convinced me to try these out (he's a big fan - especially of the stress relief ones, for when I go over to his house :) Every single variety of these gummy vitamins that I've tried has been delicious, and while I can't say I've particularly noticed benefits from the Multi, Probiotic, or Undeniable Beauty (yes I've tried them all) I think the Restful Sleep ones have really helped me. Plus, you can't feel bad about taking a multivitamin, right? As always, I would love to hear about your latest findings & favorites! Share with me below! View the rest of this series right here.